It's been pretty cold lately so I've been allowing Zoe to sleep with me in the cat tree. The one with the blanket (yeah, that's right...we've got two). Girl learned real quick that we won't sleep in it without the blanket. We'd both rather sit on the never-used second shelf than sleep in the bowl on top without the blanket. 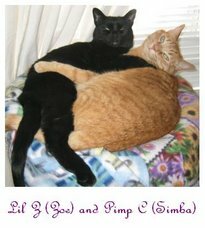 Being that we're So Cal ghetto cats, we're not used to weather that dips below 60 degree's. We hear rumors from passing birds that it can get colder, but whatever! What do they know?? Their brains are smaller than ours! Anyway, so The Brat aka Zoe usually manages to squeeze her way into my bed. First, she jumps in with me and wakes me up. This makes me pretty grouchy. I hate it when she wakes me up during a good snooze! But then she makes up for it by licking my head. It feels pretty good! As long as she doesn't lick too long, I'll let her stick around. She knows that if she doesn't stop, I'll lay a strangle hold on her along with a good bite. 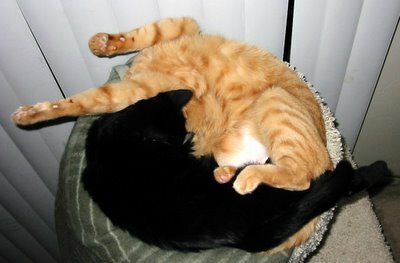 After we get nice and warm, we'll both stretch out like Yin - Yang Cats. Don't worry, we're both really comfortable. I know it doesn't look like it but we are. This one is pretty funny, look how my face is squished under Zoe. Actually, I did this on purpose. I always like to cover my eyes when the lights are on. It takes a lot of sleeping to get the energy to post. Man, I need a nap!